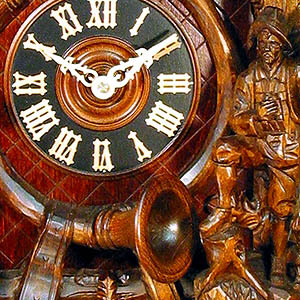 Cuckoo clocks with carvings and carved figures from the Black Forest are the classics among the Black Forest clocks. They are very popular worldwide. The tradition of carving is a unique and sophisticated craftsmanship. This art is still successfully used today by experienced carvers and wood sculptors in the Black Forest.. The creative wood sculptors from the Black Forest use local woods and materials associated with the region when decorating cuckoo clocks. Among them are the basswood, which is subsequently stained in the classic brown tone. In this way, they give the original Black Forest cuckoo clocks the highest authenticity and credibility. According to the centuries-old tradition, the elaborate carvings are still made by hand today. Cuckoo clocks with carvings are available in numerous variants and sizes. Smaller Clocks with carved elements and figures at a lower price are also available as well as the real large magnificent specimens of the premium class. These cuckoo clocks are true treasures richly adorned with filigree carvings, detailed figures and finely crafted elements. A variety of traditionally carved cuckoo clocks character characteristic motifs such as foliage or a bird. The foliage usually decorate the front of the cuckoo clock. A bird, which decorates the roof top, rounds out the design balanced. A further variant are classic cuckoo clocks, which are equipped with carved owls. They all optically reflect their origin and are clearly attributable to the Black Forest through their classic and world-famous designs. Another popular variation is the traditional Hunting Piece. This carved cuckoo clock displays as a central element instead of the bird well-known hunting designs such as a deer head with antlers, squirrels, rifles or a hunting horn, which encircles the clock-face artistically. In this kind of cuckoo clocks too, tree ornaments make the artwork complete. Subscribe to the free your-cuckoo-clock.com newsletter and ensure that you will no longer miss any of our shop offers or news. * All prices incl. value added tax. For customers outside of the European Union our shop will automatically substract the German Sales Tax (VAT) during checkout. Copyright © 2017 your-cuckoo-clock.com - All rights reserved.